DF Houston to James C. Waters Jr. 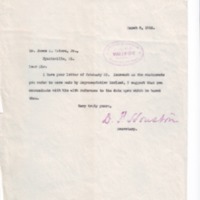 Acknowledgement of receipt of letter concerning Representative W.P. Borland's remarks on race. I have your letter of February 29. Inasmuch as the statements you refer to were made by Representative Borland, I suggest that you communicate with him with reference to the data upon which he based them. Houston, David Franklin, 1866-1940, “DF Houston to James C. Waters Jr.,” 1916 March 8, A022916b, Race and Segregation Collection, Woodrow Wilson Presidential Library & Museum, Staunton, Virginia.